This rotor aluminum die casting machine is 4 working station rotay plate. The die-casting machine is used for vertical rotor.In the rotor die casting process , Mechanical arm takes and puts self-rivet rotor core in the loading station, and then operator injects liquid aluminum in the casting station, which has somke-sucking system, auto releasing agent spraying system and cooling system, aluminum scraps come back to the aluminum melt oven. 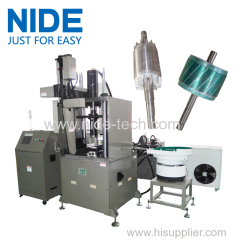 It owns the merit of saving labor cost, high efficiency and low tooling cost etc. The machine adopts enter and exit station,The rotary plate can automatically rotate to do loading and unloading. 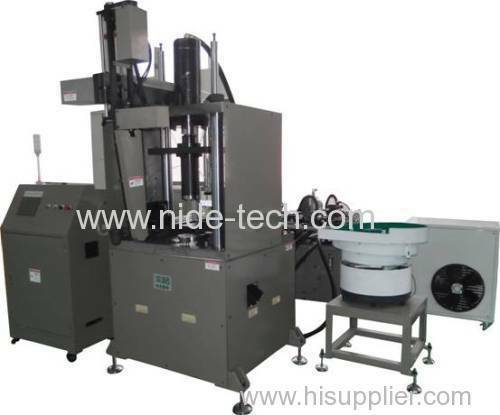 Meanwhile,this machine is euipped with auto liquid aluminum feeding system,auto release agent spraying system and cooling system,And it is featured as high efficiency, safety and easy tooling change.